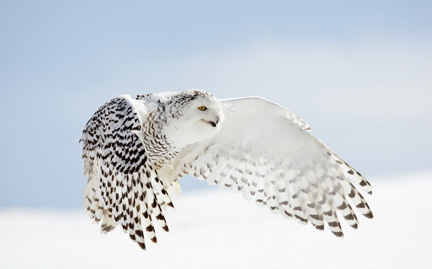 Snowy owls inhabit the tundra of coastal Alaska, Canada and Greenland, as well as northern Scandinavia, Russia and northern Siberia. During the winter months, they can even be found in the Northern Great Plains of the U.S. With their keen eyesight, snowy owls are well suited for night hunting of lemmings and other small rodents. Owls’ flight feathers are tipped with soft down, enabling them to hunt noiselessly through the bleak, arctic tundra.